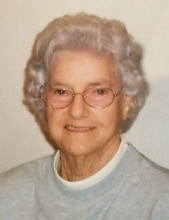 Mrs. Lydia Jewell Toller Thurman, age 94, of Tollesboro, Kentucky, passed away Thursday morning, November 8, 2018. She was born June 17, 1924, in Lewis County, Kentucky, a daughter of the late Oscar and Mary Mack Toller. Lydia was a member of the Foxport Baptist Church and was retired from social services. In addition to her parents, she was preceded in death by her husband, Roy Thurman; one son, Ray Thurman; five brothers, Fred Toller, Burl Toller, Willard Toller, Wilburn Toller, and Willis Toller; and three sisters, Ollie Wright, Zelma Griffitt, and Naomi Wilson. Lydia is survived by four children, Geralene and Charles Hurst, Gloria Meadows, Louella and Douglas King, and Marty and Francie Thurman; five grandchildren, Randy Meyer, Dean Moore, Kyle Thurman, Lisa Spencer, and Amanda Thomas; nine great grandchildren; and nine great-great grandchildren. She also leaves many other family members and friends who will sadly miss her and a special niece and caregiver, Lucille Butler. Funeral services will be held at 2 p.m. Sunday, November 11, 2018 at Dickerson Funeral Home in Vanceburg, Kentucky, with Brother Harry Meadows and Brother Arnold Howell officiating. Burial will follow in the Jones Cemetery in Lewis County, Kentucky. Friends may visit from 6 p.m. to 8 p.m. Saturday, November 10, 2018, and after 12 noon on Sunday at Dickerson Funeral Home, 110 West Second Street, Vanceburg, Kentucky 41179. Randy Meyer, Dean Moore, Kyle Thurman, Dustin Moore, Jason Spencer, Josh Bryant and Jarred Gilbert will serve as pallbearers. "Email Address" would like to share the life celebration of Lydia Jewell Toller Thurman. Click on the "link" to go to share a favorite memory or leave a condolence message for the family.